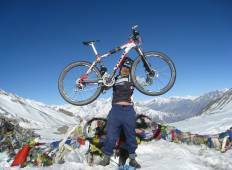 Find a Bicycle trip that explores Nepal. There are 15 tours to choose from, that range in length from 3 days up to 18 days. The most popular month for these tours is May, which has the most tour departures. "Annapurna circuit biking Simply great !!!. The organization , the staff , the guide..."
"I was 70 when I took a tour with ACE, who promised that a moderate fitness level..."
"I had a fantastic time around the annapunra. i can recommend to do this trip! Special..."